Now that you’ve enjoyed Thanksgiving it’s time to get those holiday cards in the mail. Picaboo.com has partnered with Camp Korey to offer our supporters a great way to design your cards and support camp. Click on CREATE CARD NOW and design your holiday cards. 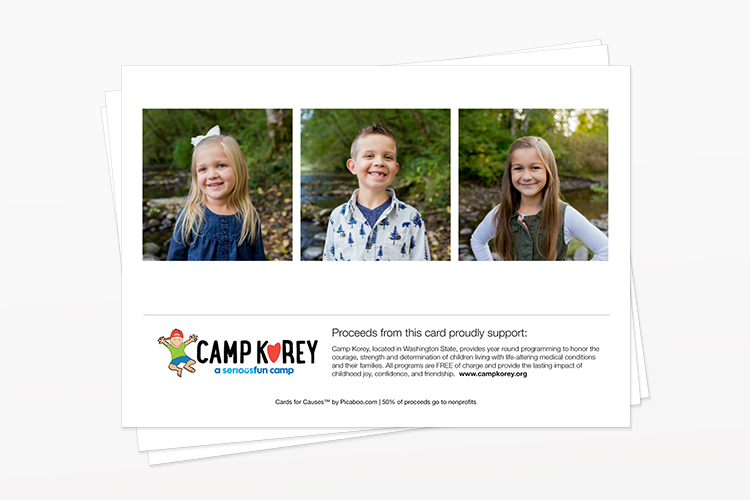 The back of your cards will display your support of Camp Korey to every person on your mailing list and Camp Korey will get 50% of what you spend back in a donation! To make this deal event sweeter, use the promo code: CARDSFORCAUSES and you’ll save 50% on your purchase price! If you buy your cards on giving Tuesday – 11/27, 100% of proceeds will come back to camp! This entry was posted in Upcoming Opportunities. Bookmark the permalink. ← Better Finds Challenge Extended through 2018!